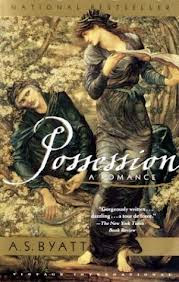 Possession also appears on Rebecca Mead's list of six favorite books that illuminate the Victorian era, Marina Warner's ten top list of fairytales, Ester Bloom's top ten list of fictional feminists, Niall Williams's list of ten of the best books that manage to make heroes out of readers, Kyle Minor's list of fifteen of the hottest affairs in literature, Emily Temple's list of the fifty greatest campus novels ever written, John Mullan's lists of ten of the best fossils in literature, ten of the most memorable libraries in literature, ten of the best fictional poets, ten of the best locks of hair in fiction, ten of the best graveyard scenes in fiction, and ten of the best lawyers in literature, and on Rachel Syme's list of the ten most attractive men in literature, Christina Koning's critic's chart of six top romances, and Elizabeth Kostova's top ten list of books for winter nights. What is Carol Berkin reading? What is Jan Elizabeth Watson reading? Pg. 69: Laura Bickle's "Dark Alchemy"
What is Jan-Philipp Sendker reading? Pg. 99: Brian Fagan's "The Intimate Bond"
What is Shelley Stamp reading? What is Cynthia Riggs reading? Pg. 69: Brian DeLeeuw's "The Dismantling"
What is Brian Fagan reading? Pg. 99: Jeffrey Gurock's "The Holocaust Averted"
Pg. 69: Rachel Basch's "The Listener"
Pg. 69: Ed Kovacs's "The Russian Bride"
What is John Renehan reading? Pg. 99: Emma Sky's "The Unraveling"
Pg. 69: Michael Gregorio's "Cry Wolf"
Pg. 99: Martin Goldsmith's "Alex's Wake"
What is Joyce E. Salisbury reading? Pg. 69: Joy Fielding's "Someone Is Watching"
Pg. 99: Tiffany Joseph's "Race on the Move"
What is Jon Land reading? Pg. 99: Nancy Woloch's "A Class by Herself"
Pg. 69: Anne Bustard's "Anywhere but Paradise"
Pg. 69: Elizabeth Haynes's "Behind Closed Doors"
Pg. 99: Dagmawi Woubshet's "The Calendar of Loss"
Pg. 69: Courtney Summers's "All the Rage"
What is Holly Robinson reading? Pg. 69: Shanna Mahin's "Oh! You Pretty Things"
What is Claire Kells reading? Pg. 99: Steve A. Yetiv's "Myths of the Oil Boom"
What is Shanna Mahin reading? Pg. 69: Jon Land's "Black Scorpion"
What is Moriah McStay reading? Seven top YA reads for fans of "Game of Thrones"
Pg. 69: Adam Mitzner's "Losing Faith"
What is Kirker Butler reading? Pg. 99: Kimerer L. LaMothe's "Why We Dance"
Pg. 69: Kirker Butler's "Pretty Ugly"
What is Robert K. Lewis reading? Pg. 69: Bruce DeSilva's "A Scourge of Vipers"
What is Declan Burke reading? Pg. 69: Claire Kells's "Girl Underwater"
Pg. 99: Donald R. Hickey's "Glorious Victory"